When it comes to introducing a new process or refining and improving an existing one, there is no better way to begin than to create process documentation. It is a common part of Business Process Management – you can’t really optimize your processes without having a clear, top-down view. 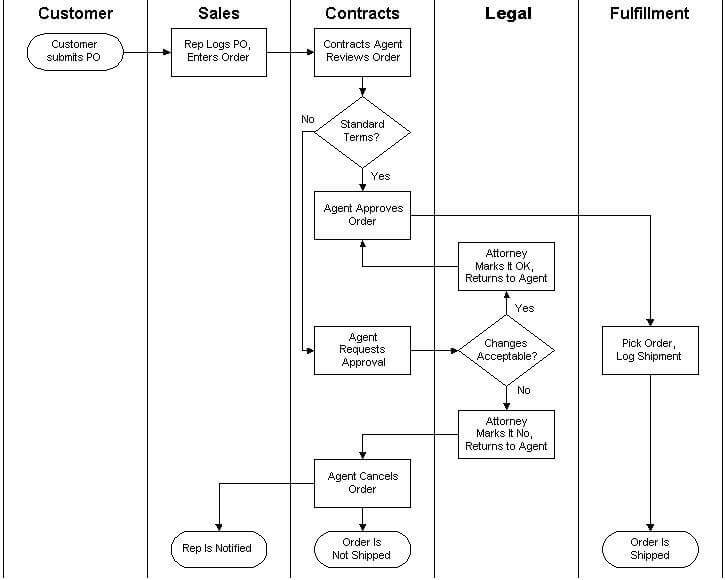 Process documentation is a flowchart with the exact steps needed to carry out a process. The term was first used in the late 1970s in the Philippines by the National Irrigation Agency as part of a project that saw social scientists document the processes used by rural farmers. Since then, it has spread worldwide and become an important business process optimization tool. A business process document works as a guide for employees at all levels of the business (or potentially also outside contractors or consultants) can utilize to see how the process should be undertaken. This allows you to use it as a reference for training new employees as part of their on-boarding induction, but even seasoned workers can benefit from having the process documented and available for them to access. It’s more than an instruction manual, of course, as process documentation can be extremely helpful in determining how the process itself can be refined or improved. Pen & Paper – Down to the very basics, you can always use pen and paper to graph out your processes. While this is probably the easiest way out, it’s far from being the best. Graphing Software – There’s dime a dozen graphing software out there, most of which do exactly that – allow you to create any kind of graph with ease. Workflow Software – Workflow software, on one hand, allows you to document your processes to help with business process improvement (BPI). On the other hand, it also keeps track of them – you can see in real-time at which step each process is, and whether or not there are any delays. Depending on the scale of the process, this might either be extremely complicated or simple. If it’s small-scale, you can probably create the entire documentation yourself. If on the other hand, it involves work between a number of different departments, then you’d have to create yourself a small team of different experts. They should, of course, come from across the business with a range of responsibilities, to ensure that all perspectives are being taken into account. This will also help with changing the process sometime down the line, if it comes to that, as you’ll have the input of the people working on the process themselves, which helps with employee buy-in. Define the scope: In order for any documentation to succeed, it’s crucial at the start to determine what the scope of the project is; which processes will be covered, what is the scale of the changes being recommended, etc. Define the inputs and outputs: Make sure you are clear what will be included in the information being gathered for the documentation and what format the outputs from the project will take. Be aware of the audience: Documentation is only useful if it is understood by the people it is being created for, so make sure you are aware of your audience and their expectations and requirements. Gather the information: This can take the form of the team brainstorming the steps required to complete the process being documented, or it can also include wider sessions with staff and stakeholders to gather as much data and information as possible. Organize: When the information is all in and the steps are defined for the process, you need to organize them all into a sequential list, ensuring that it accurately reflects how the work is done to complete the process and isn’t too complicated – otherwise it will be of little value. Visualize: Presenting the list in a workflow diagram is the key output of the process documentation, making it easier for everyone involved to see how the process works, so care and attention needs to be taken to ensure clarity and practicality. Share and get feedback: The brainstorming and feedback sessions as part of the creation of this documentation were important, but further sessions afterward will be even more useful because those involved will have the visual aid to stimulate discussion and debate. This may take the form of correcting any errors in how the process has been mapped or potential improvements to the process that have already been inspired by the project. Optimize the Process: If any improvements have been suggested as part of the project, test them and if they prove to be successful, apply them to the process documentation. It is intended to be a living document that remains active and used for as long as the process is active. Monitor: Now that there is process documentation in place, a key part of Business Process Management is to continually monitor the efficiency and outputs of the process to see whether the implemented changes are having a positive impact and also to see what else might be causing issues. The documentation should form a core asset in this monitoring. Share again: Once the process documentation is signed-off by whoever needs to sign it off, it should be shared as widely internally as possible. If this is the first time you have been through this procedure, it should be used as an exemplar for documenting other processes. As we’ve already covered, process documentation is something that any business or corporation can benefit from. At the very least, it makes sure that the know-how of the process isn’t lost due to an employee quitting. At best, it can be essential in carrying out a business process improvement initiative. If you’re looking for the right tool to help document your processes, you might want to give Tallyfy a try. In addition to simply laying out the processes, it can help keep track & manage them, ensuring the efficiency of your team. Video Guide – What is software documentation?